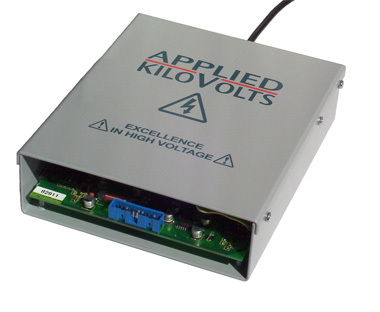 The HPZ range is a unique family of high voltage power supplies, extending the operation and versatility of Applied Kilovolts High Precision HP series. The HPZ units feature very fast slewing and settling times, together with the ability to slew cleanly through zero. With a differential control input, they operate like a high voltage amplifier with very tight temperature co-efficient of <25ppm/°C. Note - the HPZ range also features a 4 quadrant output stage, so the unit can source or sink up to its maximum output current, in either polarity. The HPZ Series is now UL recognised (E254121) up to ±10kV. A high voltage power supply can normally only source current, and does not include a mechanism for sinking significant o/p current. Our power supply modules are designed to be stable down to zero o/p current, but are only able to sink current via the feedback resistor - a few uA. If the current path is from a higher output voltage, then the output will be pulled to a higher voltage - the unit will loose control, and may well be damaged by the over-voltage. The HPZ units will not only source current, but they are also able to sink current in either polarity. So if the output is pulled to a higher voltage, the unit will sink that current to maintain the output at the set level, sinking current up to its maximum rating. Less than 100 ppm for zero to max. load. Less than 20 ppm for 1 V change in I/P volts. 0 °C to +45 °C. 159 x 184.5 x 47 mm. NB. Grounding of the case is via fixing bolts. Note - height increase to 52mm when Polarity Option is fitted. BERG 20 Way IDC header. Note1 : These units can be factory configured for 0 to +10V control input in conjunction with a polarity input pin 18. This option also configures Pin 20 as an inhibit input. This increases the unit height to 52mm.